Following the successes in the midwest, by 1909 corn clubs were spreading through the South at a rapid rate. In Virginia that first year, 10,543 boys joined corn clubs and while many of them merely went along with the crowd, some of them made records that surprised their communities. Other states were having similar experiences. On one of his trips from Washington to Mississippi, Dr. Seaman Knapp, highly pleased with the way boys’ demonstration work was going, offered a trip to Washington to the Mississippi boy who made the best record with his corn crop. His offer started something. Following up the lead, O. B. Martin made a similar offer in his own state of South Carolina. T. O. Sandy, in Virginia, raised the purse to send the Virginia champion to the Capitol, and the bankers of Arkansas promised a trip to their champion. Knapp’s idea of giving prize trips to Washington was continued the following year, and the record made by these boys was more sensational than those of the 1909 winners. The hero of the trip was Jerry Moore, 16-year-old Winona, South Carolina, boy who had raised the amazing total of 228-3/4 bushels on his acre. Jerry was headlined throughout the nation as the champion corn grower of all time. Newspapers and magazines carried his story in detail, picturing the slight, straw-hatted boy sitting on the edge of an immense mountain of husked corn – the product of his one-acre experiment. His thorough records show exactly how he prepared the soil and what he used for fertilizer. He planted Batts’ Four-ear Prolific corn by hand, about three inches apart in the drill, thinning the plants to about six inches when a half-foot high. 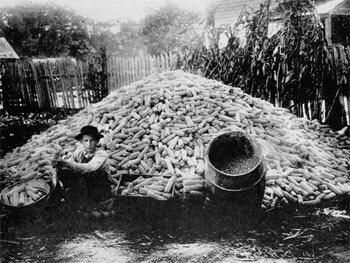 He cultivated his corn every four days. Jerry Moore’s story is worth recalling because news of his great yield arched over the nation like a rainbow, providing an apt object lesson for farmers whose yields were lower than they might have been. This entry was posted in History and tagged 4-H History, Corn Clubs by Larry Krug. Bookmark the permalink.